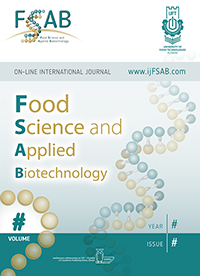 Food Science and Applied Biotechnology (FSAB) is a peer-reviewed journal which publishes high-quality research articles focused on the fields of Food Science and Technology, Food Processing, Food Quality, Food Safety, Food Chemistry, Food Microbiology, Food/Drug Interaction; Pesticide Residue Analysis; Applied Biochemistry, Biochemical Analysis, Molecular Biology and Microbiology, Biotechnology; Applied Biotechnology and Bioprocess Engineering, Enzymology and Enzyme Engineering, Biotechnological Production Systems, Genomics and Proteomics; Metagenomics, Bioenergetics, Bioinformatics, Natural Antioxidants in Food, Industrial Microbiology; Metabolic Engineering; Photochemistry; Food Physics, Food Engineering, Applied Ecology , Waste and Biomass Valorization, Food Toxicology, Aquaphotomics, Nutrition and Dietetics, Catering, Tourism, etc. The journal is an interdisciplinary platform for presentation of research and innovations and will aim to publish two types of manuscripts: new basic research and innovations and studies with more applied orientation. Manuscripts presenting simple recipes for food production with limited application and marginal or insufficient novelty; manuscripts duplicating any other previously published work; manuscripts that are currently under consideration or peer review or accepted for publication or in press or published elsewhere will be considered out of scope for the journal. This journal will publish two online issues per year and will include reviews, research articles, short communications and technical reports. - Food Science and Technology (science and technology of food and beverages, animal and plant cell tissue as food raw materials, food enzyme processes and interaction, packaging and food shelf life, use of natural antioxidants in foods and drinks, etc.). Particular areas of interest include: Food Science and Technology, Food Processing, Natural Antioxidants in Food, Wine and Alcoholic Beverages, Beer and Soft Drinks, Water, Perfumery, Cosmetics, Tobacco Science and Technology. - Food Quality and Safety (monitoring of food quality and safety, etc.). Particular areas of interest include: Food Quality, Food Safety, Food Chemistry, Photochemistry, Food/Drug Interaction, Pesticide Residue Analysis, and Food Microbiology. - Food Biochemistry and Molecular Biology (biochemical changes during food and beverage processing, studies on enzyme interactions in food, influence of enzyme activity on food quality, enzyme methods for accelerated food production, etc.). Particular areas of interest include: Applied Biochemistry, Enzymology, Biochemical Analysis, Molecular Biology and Metagenomics. - Applied Biotechnology (microorganisms, plant cell tissue and organ cultures, algae, monitoring of bioprocesses, enzymes, etc.). Particular areas of interest include: Biotechnology, Applied Biotechnology, Bioprocess Engineering, Enzymology and Enzyme Engineering, Industrial Microbiology, Genomics and Proteomics, Metagenomics, Bioenergetics, Bioinformatics, Plant Biotechnology, Metabolic Engineering, Applied Ecology, Waste and Biomass Valorization, Food Toxicology, Molecular Microbiology, Pharmaceutical Microbiology. - Nutrition and Tourism (nutrition, diet and dietetics, food storage, cooking, refrigeration, preservation, food services, catering, hospitality management, hotel management, tourism, etc.). Particular areas of interest include: Nutrition, Dietetics, Food Services, Catering, and Tourism. - Food Engineering (food processing, food preservation, food engineering, physical properties of food, structural and mechanical properties of food, heat and mass transfer processes, electrical properties of food, machines and apparatus, automation of the food, wine and tobacco industries). Particular areas of interest include: Food Engineering, Food Physics, Photochemistry, Aquaphotomics, Structural Analysis, Mechanical Analysis of Food, Heat Transfer, Refrigeration, Mass Transfer, Processes and Apparatus in Food Industries. The above list is only indicative. Journal editors welcome thought-provoking papers on areas not listed above, but drawn within the disciplines of Food Science, Biotechnology and Food Engineering.